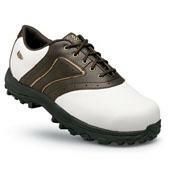 This is a shoe for the golfer on the go. The sole is made with durable VIBRAM leather. Traction lugs are strategically placed for maximum traction on the course, trail or street.